Still need to fill up your kids’ stockings? Let me help. Because I’m very solicitous and hospitable like that. I’m giving away two Kookeys and two Tracksters, which are perfectly-sized for Christmas stockings. Unless you bought tiny stockings. Which in this economy, who could blame you. I hope you win these prizes then. I have a Penguin Kookey and a Puppy Kookey to give to some lucky (and possibly broke) people. To read a bit more about Kookeys (stuffed animals that come with a code allowing you to bring your toy “to life” in a virtual environment online), click here. 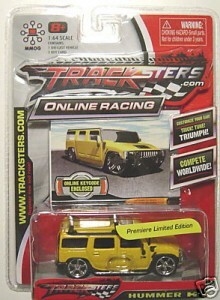 I also have two Tracksters (a Hummer and a 2006 Dodge) to share. 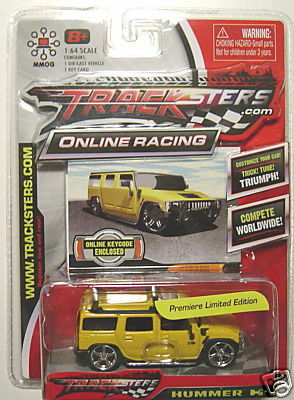 Tracksters are diecast cars, along the lines of Hot Wheels, that have online counterparts allowing players to race and accessorize their cars. (Here, let me explain that better: the car comes with a code that you enter online at www.tracksters.com to set up your online car to compete against others across the globe.) I’m bad at describing car stuff. To enter to win, please just leave a comment with which prize you want (either the Kookey or the Trackster) and you will be cast into my randomizer contest entry winner picker outer machine. And here’s the thing: if you have two kids in mind for these gifts, and if you note that in your comment, and if you win, I will send you two Kookeys or two Tracksters. I hope that made sense. It involved math, and that’s my slippery slope. Good luck! The giveaway ends Wednesday, December 17 at 5PM PST. I’m in for the Tracksters!! I would like either the vacation home in Aspen, the new Mac Pro Tower with 8-core power (including the LED cinema display and an extra Wacom Cintiq 21Ux Monitor), door number 3, or whatever’s in the big box that Judy is bringing down the aisle. But I will settle for world peace, good will, tolerance, humility, or patience. Or a Lamborghini (which I can then trade in for a dozen Prius’s/Priusses/Priui whatever). not sure about the math, but i have two kids and would love 2 of each? or 1 of each? whatever. i’ll take whatever you will give me! If I tell you I would love the Penguin Kookey to give to my mom, who loves all things penguin, would it lessen my chances? Also? Can I have your big toe? The left one. Thanks. Kookey. My son would love one. So you just have to count me in this one. Jake would love the truckster. Now I must go check them out. You rock SDM! I’m sure that my two kids would each love a Kookey. Somehow they can remember all their virtual pets names and passwords. It’s an addiction! Those kookey’s look delicious. My daughter (9 1/2 months) would love to eat them. That’s what babies do. i want the puppy. he’d totally fit in my stocking. Very cute! I’d take either or or both! The Kookeys! My daughter LOVES animals, and either one would be perfect, peeking out over the edge of her stocking. I wasn’t going to comment/enter b/c I’ve never tried these virtual pet things w/ my kids but I just won won something on We Covet so I figure my karma is such that I won’t win here. So I just wanted to say how ADORABLE that penguin is! My two boys would love the Tracksters! The Trackster would make LD’s Christmas pretty damn cool. I have two kids, a boy and a girl who would love either or! Or maybe I can play with them too?